In 1970, Philippe Herreweghe founded the Ghent choir Collegium Vocale Gent. They were one of the first ensembles to use new ideas about baroque performance practice in vocal music. Authenticity is the core concept on which Collegium Vocale measures the value of music. What we can do is to try to rid musical tradition of the ‘noise’ that inevitably arises in the transfer from one generation of musicians to the next, with utmost care and precision. This basic attitude is of essential importance and is embedded in the concept of authenticity. Accordingly, authenticity in its original sense of ‘made with one’s own hands’ (…). The program for 2019 looks as promising as always. The festival opens with a lively party in Asciano. As usual, the Poggibonsi fanfare blows the Festival on its way and treats the festival with a festive glass of prosecco on the terrace of Piazza Garibaldi / Bar Hervé. Beautiful musicians provide a varied evening: Ensemble Masques, soprano Eleanor Lyons and pianist Stanislav Solovev, the ensemble Mala Punica led by Pedro Memelsdorff and Philippe Thuriot as a closing. There are also famous musicians as pianist Nelson Goerner, cellist Andreas Brantelid and lead singer Christoph Prégardien. Members of the Antwerp Symphony Orchestra and Concertgebouw Orchestra Amsterdam play a chamber music concert on Monday and Friday, respectively. The Edding Quartet will play an intimate late-night concert on Wednesday evening, and accordionist Philippe Thuriot will end the day with a free improvisation concert on the outdoor stage at Bar Hervé on Monday and Thursday evening. In 2019 the Collegium Vocale Gent guarantees two refined evenings full of music and poetry. On 30 July, the magnificent O Primavera by Heinrich Schütz (1585-1672) is on the program. The soloists of Collegium Vocale Gent conclude the festival on Friday evening, August 2 at the Monasterio Sant'Anna in Camprena with the Psalms Davids by Heinrich Schütz. Read the full program here on the website of the Music Festival Collegium Vocale Crete Senesi. You can also order tickets or a subscription. 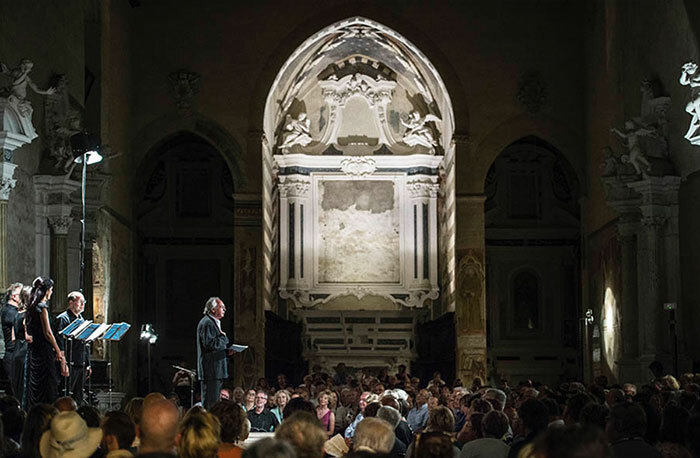 The soloists of Collegium Vocale Gent conclude the 2019 festival on Friday evening, August 2 at the Monasterio Sant'Anna in Camprena with the Psalms Davids by Heinrich Schütz. Another special event is the performance of Heinrich Schütz’s O primavera, gioventù de l'anno (Italienische Madrigale) by Collegium Vocale Gent and Philippe Herreweghe on Tuesday, in the marvelous setting of the Sant’Anna in Camprena monastery. Look for the beautiful frescos by Giovanni Antonio Bazzi (Il Sodoma) in its Refectory. Before each evening concert, a free drink is offered in the square at the entrance of each concert venue. After each evening concert you can subscribe to a dinner. Collegium Vocale Crete Senesi is an organization of Collegium Vocale Gent. Enjoy the 2018 edition through the wonderfull pictures by Frédéric Bourda. 2017 was a special year: the year in which artistic director Philippe Herreweghe celebrated his 70th birthday and in which the world was celebrating the Monteverdi-year (Claudio Monteverdi was born 450 years ago). For the first time, there was also a masterclass under the inspirational leadership of Philippe Herreweghe and Stefan Hertmans. Three universities, VUB, ULB, UGent and Tomorrow's Legacy program at EY Belgium combined their forces and brought together some of their students to immerse themselves in a culture bath in Asciano for 6 days. One of Tuscany's best kept secrets is the beautiful valley sheltering this recently renovated 18th century farm house, in the Valle d’Ombrone. Breathtaking view on Maremma hills and the Valle d'Ombrone from #poderesantapia. Podere Santa Pia is an artistic property, perfect for relaxing and enjoying the splendor of the Maremma hills of southern Tuscany. This formal cloister offers the quiet tranquility of a private retreat, with numerous attractions, beautiful nature reserves and unspoilt beautiful beaches within easy reach. 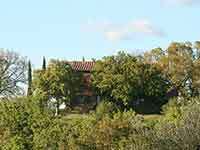 Podere Santa Pia is a beautiful stone farmhouse south of Montalcino, and only 2 km away from Castiglioncello Bandini. The main house is spacious, comfortable and offers its guests a breathtaking view over the Maremma hills. Podere Santa Pia enjoys a wonderful panoramic view of the Tuscan Maremma and has a large garden with Downey oak, cypress, rosemary, laurel and many other plants that are typical of the Mediterranean. Half of the garden is covered with macchia Mediterranea: wild, untamed and completely natural vegetation. Podere Santa Pia is the ideal place to pass a very inspiring holiday in contemplation of nature. Podere Santa Pia provides an authentic experience of living the ‘Italian dream’: the stunning location, the artistic house create an ambiance that captures the true spirit of being a guest in Tuscany. Photo by Michiel Hendryckx, released in the Public domain. But what I am searching for is not "authenticity" in the way this term is usually understood. We cannot hear Bach's cantatas as the congregation in Leipzig heard them because we are very different people, just as we cannot hear Bruckner's music as he heard it. But what we can hear, or can help to communicate as performers, is an authenticity in the sense of allowing the music to be true to itself.